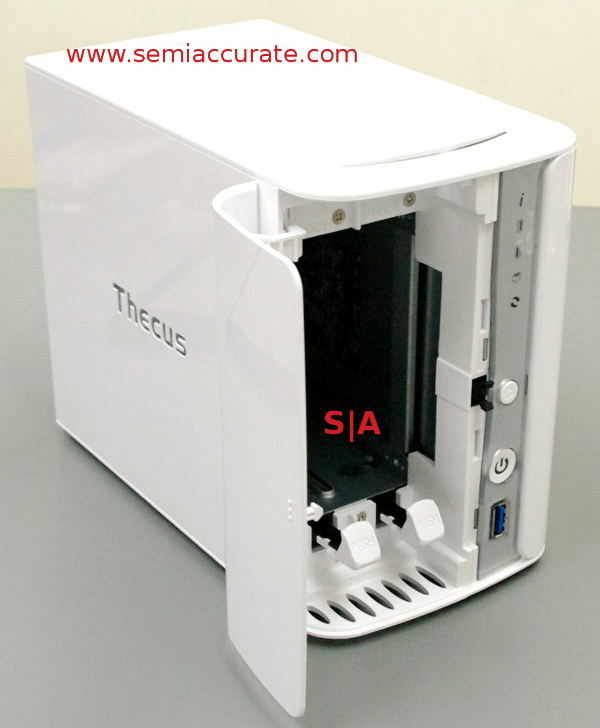 Thecus has revamped their lower end NAS line once again, but this time the new N2560 is quite different from before. The new design is much more organic and has more features than before. There are actually two new devices, the N2520 2-bay model and N4520 4-bay that differ mainly in the drive count. They both use an 32nm Intel Atom CPU for power and are fanless on the mobo but have active cooling for the HDDs. The new line now supports USB3 and best of all the is a screwless rail system for the drives, rails snap in to the screw holes and then just slide in. This is far more useful than it sounds. The N2520 NAS box has the aforementioned USB3 port in front, two more USB2s in back, and a GbE NIC as well. A/V functionality is now standard on this line with an HDMI port and SPDIF on the rear panel too. On the controller front the N2520 has 1GB of RAM and the N4520 has 2GB to better support the 4-bays. The bigger NAS also adds a second GbE port but is otherwise the same.